I finally got access to the SCG again after a few months of delays while they relaid the turf. Working with my colleague Dr. Andrew Yip (Art & Design UNSW), we did a full aerial survey of the stadium using a drone. 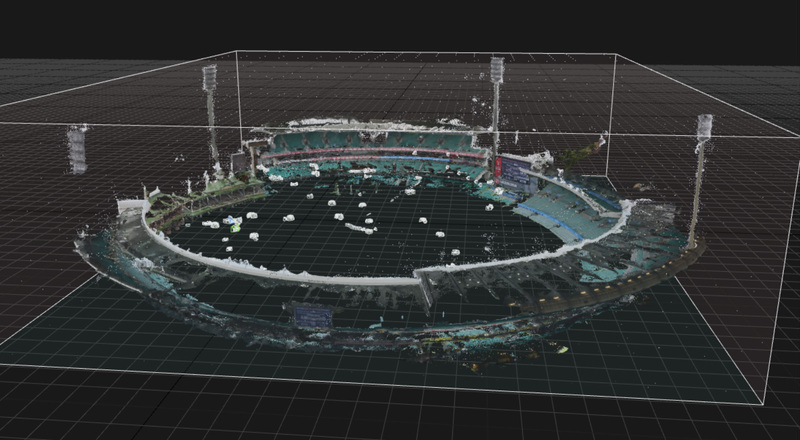 After taking about 800 photographs, we were able to recreate the SCG in 3D space using photogrammetry software Reality Capture. From here, I imported the point cloud data into Unity, a very powerful game engine using this plugin. From here, I’ll be plugging in some of the crowd audio and player data to recreate the 2017 AFL Round 23 Swans v Carlton match, whilst playing around with some of the aesthetics of the point cloud data. 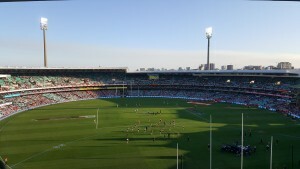 It was a beautiful Sydney winter’s day to watch the Swans play Carlton in the last round of the regular season on Saturday. This match was my first big data collection, and from here I’ll begin processing audio and video data of the crowd, combined with some broader contextual information I’ll be gathering. One key thing I need to do is establish a classification system for crowd activity – not only volume and intensity, but also sentiment and location. 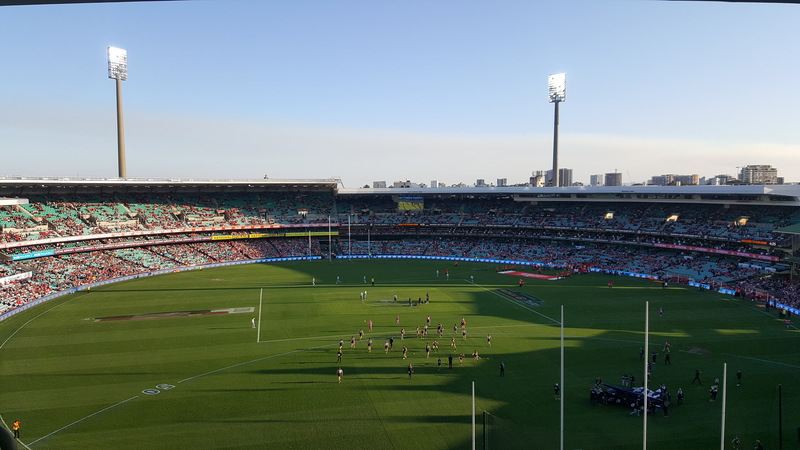 One thing you notice at the AFL specifically is how localized crowd noise can be, due to the enormous distance between one end of the oval and the other. The term ‘crowd’ tends to simplify and homogenize what is, in fact, a very diverse and dynamic system of individuals. It can be quite difficult to see what’s happening at the opposite end of the field, and the players only directly interact with the crowd towards the boundary. Using player GPS data and location specific audio recordings should provide a spatial account of this interaction. 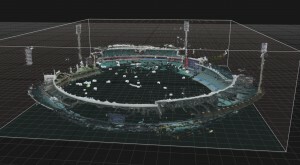 Progress from 3D photogrammetry of the SCG, using 360 video and standard DSLR photography. Mapping the architectures of the stadium is important to determine how the structure amplifies/effects the crowd’s intensity. Still experimenting with process and techniqes right now, but I’m encouraged by these results so far! Thanks to Dr. Andrew Yip from iGlam UNSW for his expertise! So far, I’ve been immersing myself in Sports Science literature and techniques, learning how player performance is tracked, measured and interpreted. Next week, I’ll be using a technique called stereophotogrammetry to create a 3D model of the SCG using an array of 6 GoPro Heros in a rig called the Omni. By taking a few thousand still images from the grounds of the SCG, I’ll use special software to stitch together a 3D model of the stadium. From here, I’ll be able to use the architecture of the stadium as a scaffold for some interesting immersive experiments with the GPS performance data I’ve been able to access from AFL players. After this, I’ll start collecting data about sporting crowds, including audio, video and other forms of measurement, before thinking about ways to combine and cross-reference this data with player performance metrics in an immersive environment. It is a great thrill to be getting started on my 2017 Synapse Residency with Prof. Aaron Coutts and the good folks at UTS Sport and Exercise Science! The aim of the project is to see if there is a way to quantify the crowd’s influence on player performance. Already, AFL players are tracked using micro wearable units that include GPS and accelerometers. The amount of data generated from these devices in a given game is huge. Every movement is tracked, stored and interpreted in an effort to understand performance and mitigate injury. GPY&R Melbourne ‘Game Signatures’, a collection of unique ‘autographs’ created from player GPS tracking data. Anecdotally, anyone who has ever been to any major sports match would agree that the crowd creates intense and tangible atmospheres. Yet how can this be measured? Perhaps the compelling languages of creative practice, paired with the statistical analysis of player performance, can begin to answer this question. Any sports fan will tell you that sport is a deeply emotional, cultural and aesthetic practice. The work of 19th Century psychologist William James and his ‘radical empiricism‘ will provide one of the philosophical frameworks for our research. In short, he urges us to consider experience beyond a simple ‘stream of data’, but to consider relations as significantly as objects and perception. Sport is all about relations, affect and flow. In a word, it is about events.